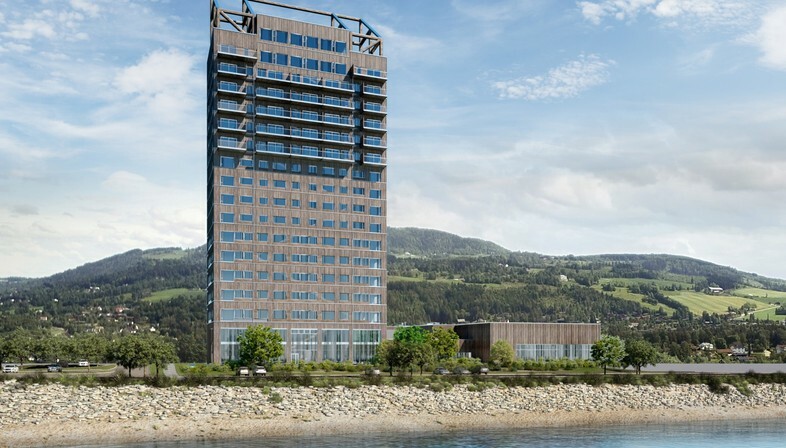 Norway has set an important record for timber buildings: at 85.4 metres tall, Mjøstårnet, designed by Voll Arkitekte, is not only the country’s third tallest building but the tallest timber building in the world. This important record is made possible by progress in the use of wood as a structural material and growing interest in timber, the world’s only truly renewable building material. In Brumunddal, a small town with a population of 10,000 just over 100 km from Oslo, the recently completed Mjøstårnet is a timber skyscraper designed by Voll Arkitekter. What makes Mjøstårnet unusual is that it is not only Norway’s third tallest building, but the tallest timber building in the world. This important record is made possible by technological progress in the use of wood, particularly glulam, as a structural material and recognition of timber as a sustainable choice and the world’s only truly renewable building material. The Mjøstårnet stands in an area of particular significance in terms of landscape, for the site is close to Norway’s biggest lake, Mjøsa, and has rapidly become an important landmark. The building’s environmental context is also significant in terms of its relationship with nature, as the area is well-known for its silviculture and lumber industry. A number of important factors pointed toward use of wood in construction of the building: first of all, the local availability of large quantities of timber, a zero km material which could be processed in industries less than 15 km away. Environmental sustainability is another factor, alongside these practical reasons, as timber is the world’s only truly renewable building material. The architects paid great attention to the strategies implemented to limit the building’s ecological footprint, profoundly convinced that architecture and proper architectural design offer a concrete way of combating climate change. All these factors make the 85.4 metre tall Mjøstårnet an important landmark in the area, visible from far away; and in fact the Norwegian name means “Tower on Lake Mjøsa”. The entrance to the building is located in a little plaza on the northwest side of the site which also affords access to a public pool occupying a total area of 4,900 sqm. On the southern side, toward the lake, are public gardens and outdoor spaces connected with pedestrian footpaths and cycling paths linking the town of Brumunddal with nature paths in the area. The 18-floor building houses a number of functions: the ground floor contains a big common hall, a reception area and a restaurant; this is followed by offices with meeting rooms and technical premises up to the seventh floor; a hotel occupies the eighth to eleventh floor; and from the twelfth to the sixteenth floor there are six apartments of different sizes on each level. The seventeenth floor contains two more apartments and a big event space for celebrations and conferences, while the top floor has a big public and private terrace with a penthouse. The building has been presented with important awards, including the 2018 New York Design Awards in December, while the Council on Tall Buildings and Urban Habitat (CTBUH) recently certified its height and acknowledged it as the "World's Tallest Timber Building".